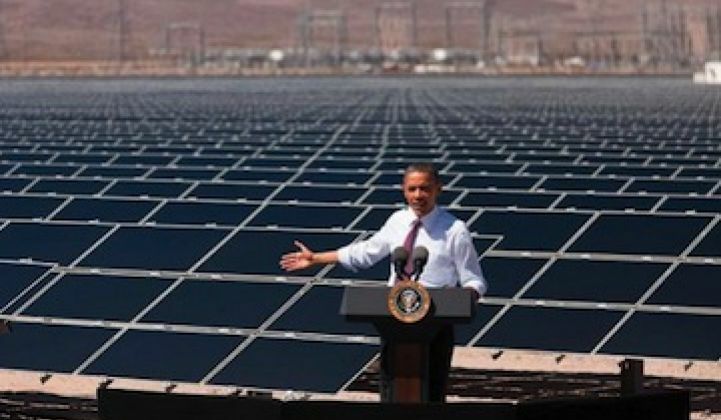 Some barriers to popularizing the property-assessed clean energy (PACE) program across the U.S. were cleared today with an announcement made by President Obama at the National Clean Energy Summit in Las Vegas, Nevada. PACE loan programs let homeowners finance energy-efficiency upgrades, such as adding insulation and water savings measures or installing energy-efficient windows or solar panels, to be paid back as a line item on the homeowner's property tax bill. This lowers the risk for lenders and owners and can potentially build a much larger energy-efficiency market. But PACE obligations enjoy first-lien status in most states, making municipalities first in line to be repaid -- ahead of the mortgage agencies, in case of default -- and mortgage agencies don't like that. As Cisco DeVries, CEO of Renew Financial, notes in a release, "The FHA, which insures over 20 percent of new mortgage originations in the United States, outlined a set of principles associated with their new guidance -- including allowing PACE financing to transfer between owners during the sale of the home if the PACE lien can be subordinated during a foreclosure." California completed about $500 million in residential PACE projects for approximately 25,000 homes in 2014, according to PACENow, a nonprofit that promotes the PACE model. The commercial market has closed about $100 million in completed projects, with another $400 million in the pipeline. The approximately $600 million in completed projects is up from about $60 million in 2013. DeVries spoke of work going on in Washington, D.C. and California over the last six months on residential PACE by regulators "with compromises by everyone and changes on how residential PACE is handled." The California state treasurer’s office launched a $10 million PACE Loss Reserve Program, which the California Senate required to mitigate the risk to mortgage lenders for losses related to PACE liens in foreclosure situations. He said that "homeowners and contractors are happy" and the "data is very strong that this is working well." DeVries said the market was seeing less "regulatory uncertainty" with a clear method of "protecting mortgage holders." Tom Kimbis of the Solar Energy Industries Association noted, "The FHA has 5 million mortgages in its portfolio, but investors have been hesitant because of mixed signals and interaction between local and federal governments. The key is bringing more certainty to the FHA marketplace." Kimbis said the new changes would allow access to previously untapped markets with much greater certainty. J.P. McNeill, CEO of Renovate America, operator of the HERO Program and a PACE provider "with more than 40,000 funded projects in California in more than 35,000 homes," noted in a release, "We are pleased the White House and FHA recognize PACE...and enshrine in federal policy today a core principle of the program: ‘When the property is sold, the remaining PACE loan stays with the more energy-efficient property and the next owner is responsible for repaying the loan.’ As the policy guidance points out, PACE enables homeowners to benefit from the improvements immediately, spread the cost over time, and transfer the value of the retrofit from one owner to the next. PACE legislation has been passed by 31 states, and nearly $1 billion in projects has been financed using PACE, despite opposition from mortgage holders. "There have been many thousands of projects completed since 2008. And there's no evidence that PACE has caused defaults," said DeVries. "Today is a very big day for PACE," said DeVries, adding, "The concept is ready to go national." Stacey Lawson, the CEO of Ygrene Energy Fund, a PACE administrator, concurred, "PACE is now at the forefront of national energy efficiency policy." Illustrating the uptake of PACE, Ygrene is announcing more than 90 new cities and counties across California that have adopted its PACE model. Creating a DOD Privatized Housing Solar Challenge, and announcing companies that are committing to provide solar power to housing on over 40 military bases across the U.S.
Katie Tweed and Stephen Lacey contributed to this article.